Members of the Millennial generation—which roughly includes those born from 1980 to 2000, who are currently around 15 to 35 years old—face unique challenges to financial stability as they start their families. Across the United States, high-quality, affordable child care is a crucial part of daily life as parents try to balance work and caregiving responsibilities. Sixty-five percent of children under age 6 have all of their available parents in the workforce. Unfortunately, as Millennials begin to raise children, they are feeling the brunt of growing child care costs. From 2000 to 2012, child care costs increased $2,300 for a typical middle-class family, and they show no signs of slowing down. This brief details the unique challenges faced by Millennial families, as well as how those families would benefit from the new High-Quality Child Care Tax Credit proposed by the Center for American Progress. In 2014, there were more than 16 million 15- to 34-year-old mothers, and that number is growing quickly. Similar to the generations before them, Millennials are starting families while rates of unemployment are still high and far before they reach peak earnings in their careers. Millennials have higher poverty rates, lower incomes, and more student debt than the generations before them did at the same age. The share of 18- to 34-year-olds who were living in poverty increased from one in seven in 1980 to one in five in 2013. After adjusting for inflation, the median annual earnings of 18- to 34-year-olds decreased $3,500 between 1980 and 2013. Additionally, 20 years ago, the majority of students did not take out any loans for college; in 2015, 71 percent of college graduates had college loans. This year’s college graduates had an average debt burden of $35,000—more than double the average in the early 1990s. Rising child care costs put intense pressure on new parents, especially when their children are young and child care is most expensive. The average cost of child care for infants under 12 months old is $18,000 per year, based on 45-hour weeks year-round. This is more than the entire annual income of a parent earning the minimum wage for the same amount of time. Notably, Millennials are more likely to earn the minimum wage: In 2014, 16- to 34-year-olds made up more than 70 percent of minimum-wage earners. Parents need access to affordable, educational, and safe child care for their children. Unfortunately, there are few affordable and high-quality options, especially for infants and toddlers who require more intense care. Nationally representative data suggest that current providers only have the capacity to care for 10 percent of all children under 12 months and 25 percent of all children under age 3. In addition, the United States has the third-highest child care costs as a percentage of family income compared to other developed countries, and current child care subsidy programs are simply not enough. The Child Care and Development Block Grant—a federal program that funds state block grants to subsidize the cost of care for low-income families—only reaches one in six eligible children. The Child and Dependent Care Credit allows families to take a tax credit to help pay for child care. However, the tax credit is not refundable, which means that families who owe little or nothing in taxes do not benefit from it. Millennials are more racially diverse than previous generations, and this pattern will continue for their children as well: In 2014, 50.2 percent of children under age 5 in the United States were children of color. Millennials of color often face more intense financial pressures than the rest of their generational cohort, including higher youth unemployment rates and more student debt. In addition to added financial pressures, child care is often even further out of reach for families of color, both in terms of quality and availability. An analysis of data from the Early Childhood Longitudinal Study—which examines a nationally representative sample of children in early education—finds that while the majority of all children are in mediocre-quality early education settings, African American children are the most likely to be in low-quality programs and least likely to be in high-quality programs. Hispanic children are more likely to be high-quality programs when they attend early education but are less likely than their peers to have access in general. 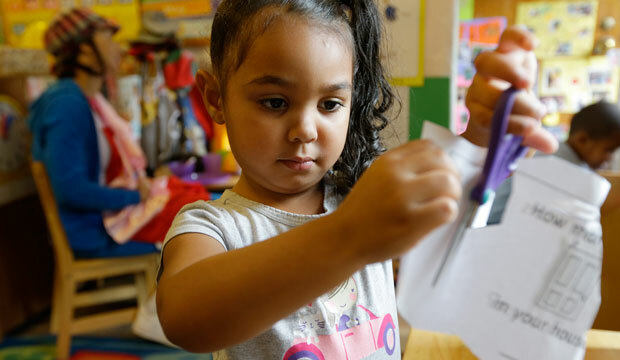 In addition to increasing affordability and quality for all children, a successful child care proposal must address the disparities in access along socioeconomic, racial, and ethnic lines. High-quality child care has a wide range of benefits for children. For example, a National Institutes of Health study of child care quality for children under age 4 and a half linked high-quality care to improved cognitive development, social skills, and health outcomes. Research suggests that high-quality care has a significant impact on the social development of low-income children, especially low-income African Americans. Children who have access to high-quality early childhood intervention are also more likely to graduate from high school and less likely to be arrested as juveniles. Access to a continuum of high-quality child care and universal preschool is essential to the well-being and future successes of young children—particularly children from low-income families and families of color. Help families afford child care. The credit would be paid directly to eligible high-quality child care providers of the parents’ choice over the course of the year, ensuring affordability and access to high-quality providers. A monthly credit also means that families would not have to pay for child care upfront and wait for reimbursement in their tax refund at the end of the year. Support parent choice and quality child care. The credit would be payable to a child care provider of the parent’s choice that meets quality standards determined by state Quality Rating and Improvement Systems. The program would create a financial incentive for child care providers to improve quality and provide a tax credit calibrated to cover the cost of high-quality child care, creating a range of high-quality child care options for families. Ensure access to the credit for the families who need it most. The combined value of the credit and family contribution would be worth up to $14,000 per child under age 3 and would be available to families earning up to 400 percent of the federal poverty level for household income. The credit would also provide up to $5,000 for preschoolers accessing extended-day and summer child care for families up to 200 percent of the federal poverty level. Families would pay a portion of their total income, ranging from 2 percent to 12 percent, toward their child care expenses. Index the credit’s value to inflation. Indexing the value of the credit to inflation would ensure that the credit remains at its intended value for the families who need it most over time. Child care is a critical resource for working families, but the current system is not working. For Millennial families in particular, the lack of high-quality affordable child care is a huge barrier to attaining financial stability. Both the full economic participation of parents and the well-being of the next generation depend on access to stable, high-quality, educational care. The High-Quality Child Care Tax Credit offers a new vision for child care in the United States—one in which vulnerable working families have access to the high-quality care they need. Sunny Frothingham is a Policy Advocate for Generation Progress. Katie Hamm is the Director of Early Childhood Policy at the Center for American Progress. Jessica Troe is a Research Assistant for the Early Childhood Policy team at the Center.